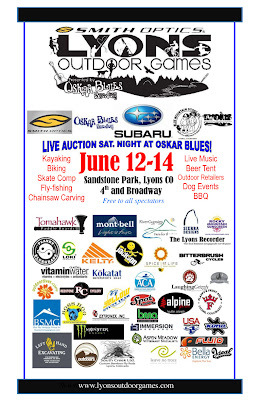 The Lyons Outdoor Games is less than two weeks away, and the town's dozens of volunteers are cranking along. The Lyons Bike Park (new public pump track) is nearly finished, and the other sites are being readied. In addition to the tons of sponsors we already have on board, we are pleased to announce Whole Foods is donating fresh fruit for all volunteers and competitors. Plus, we've welcomed Elevation Outdoors Magazine on board as our media sponsor. They are bringing tons of mags to the event, as well as goodie bags and donations for the auction. Check out the blog next Monday for a complete list of all the fantastic auction items we will have at the Games. Also check in the next few days for the South Saint Vrain video, an article on World Champion kayaker (and Lyons local) Scott Shipley, as well as other news of the Games!